I've just completed four firings in 3 days, and two of those firings were to create some awesome puddle melt pendants. 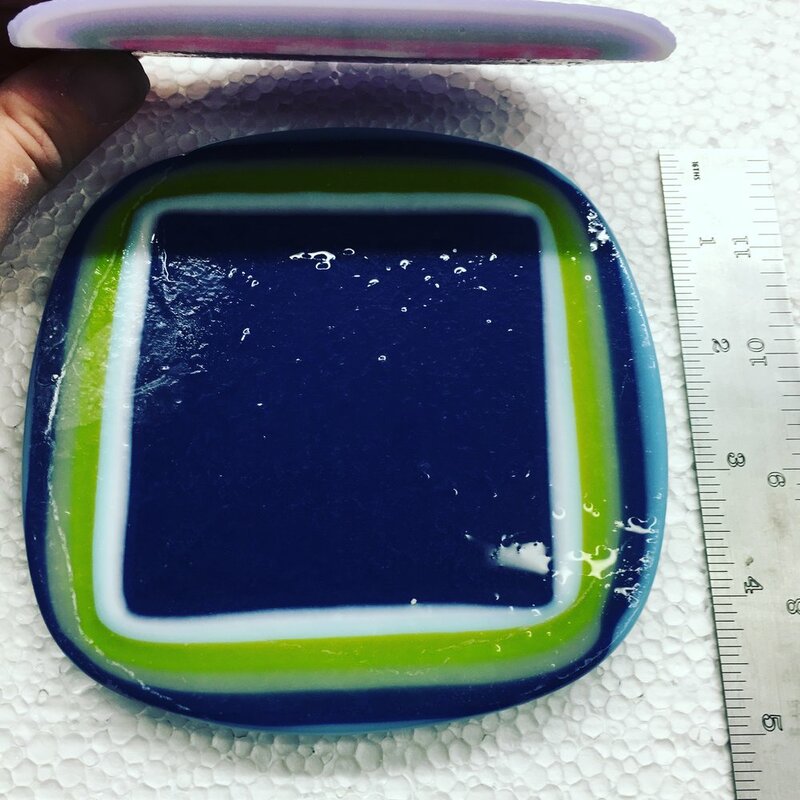 Every time a firing is finished, I'm stoked to open up the kiln, but this last run was especially cool because I really didn't know what I'd find. First step was to make the puddles that would later be broken up to make the pendants (and other things - I have reserve puddle chunks for another day!). I stacked up 6 3"x3" squares of glass, and put them in the kiln. 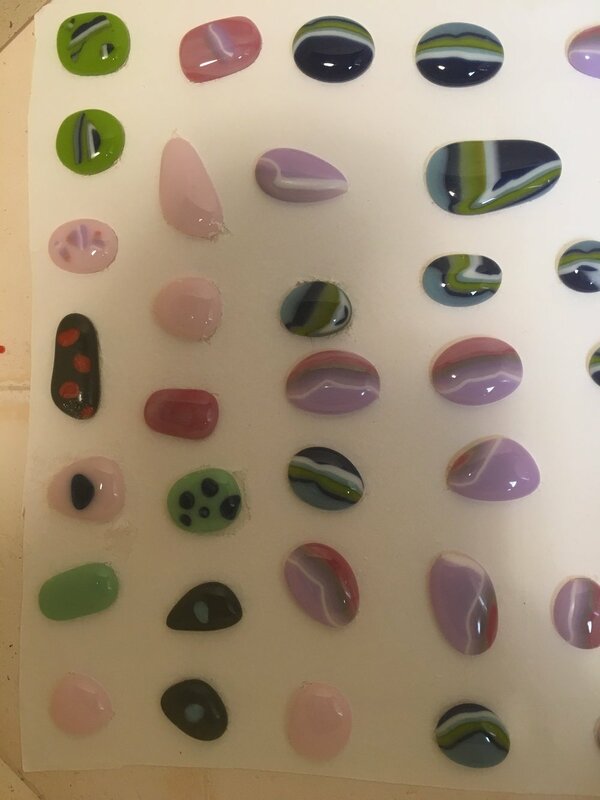 I made two piles, one with blues/green/white/grey, and another with pinks/purples/white. I put them in the kiln on top of some shelf paper, and left plenty of room around them so they could spread out. When the glass is fired, it spreads out - the photo above shows the bottom of the resulting puddle - each layer flowed over the edge of the one below. Size of the final puddle was about 5"x5" and 7/16" thick in the middle. I used a full fuse firing schedule, holding at 1500F for 30 minutes. This fire took about 6 hours. To turn the puddles into usable chunks, they need broken up. I tried score-and-snap, but it was way too thick for that. I read people had luck scoring and hitting with a hammer, but for me that didn't break nicely and just shattered the puddle into 8-10 pieces. That was fine though since it gave chunks I could start working with - but wouldn't be optimal if I was trying to get a lot of nice slices. I also ran the pink square thru the Taurus ring-saw, and the saw cut it like a champ. But I don't want to use up my blade on these, so I probably won't try that again. We do have a tile saw so I think I'll give that a go on some of the leftover puddle chunks. Anyways. 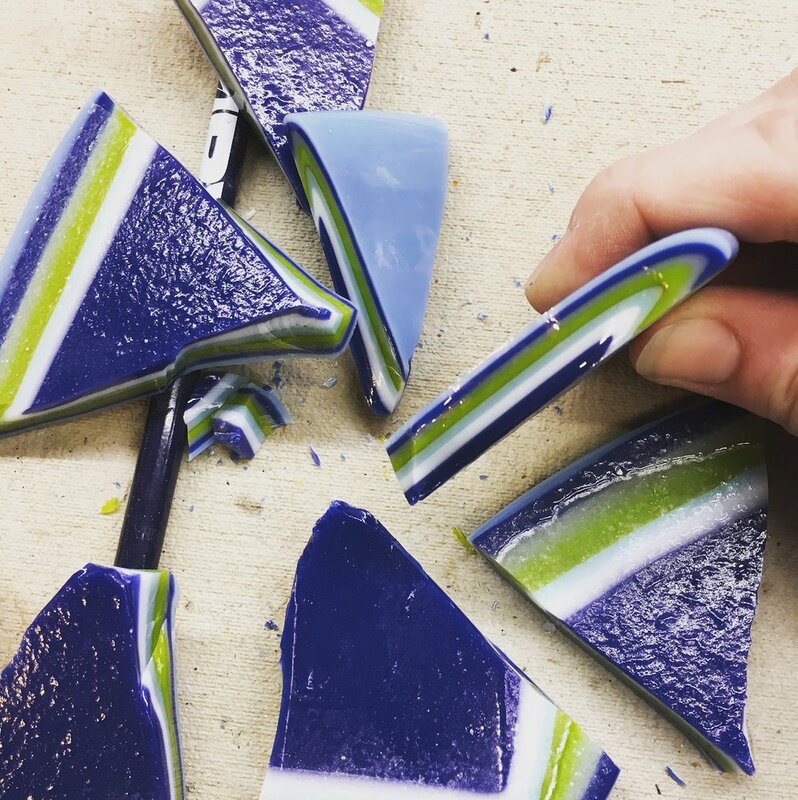 Use a hammer to break, or then I found that my mosaic tile-nippers worked well to break off the pieces for the pendants. Whatever you do, wear your safety glasses! I made a bunch of smallish pieces to fire as pendants. 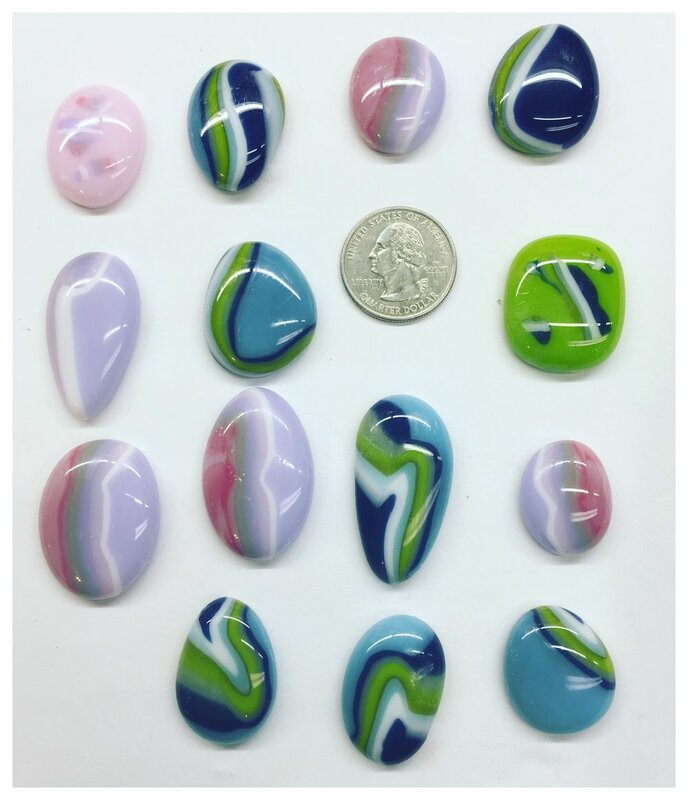 It was hard to tell from the chunks how big the pendants would be so I weighed them as I broke them off - tried to aim for 6-15 grams in weight to get a variety of sizes. I think I broke up about half of each puddle and I have other plans for the rest. I put shelf paper on the bottom of the kiln, and on top of that, placed the chunks up on end (so the stripes are visible from above, and fired again to a full fuse. I wasn't sure how close to place them to each other so I left some space around them. Over on the left-hand side, I tried some other ideas with pieces of sheet glass topped off with dots or some of the skinny shards that came off the puddles when I was smashing them up. I read on someone's page that it would be better to use shelf primer instead of paper since they'd round better - but I wanted to make max use of my kiln space and just put paper directly on the kiln floor (my shelf is a smaller area so I could only have made about 2/3 of this number). And I like the irregular shapes! 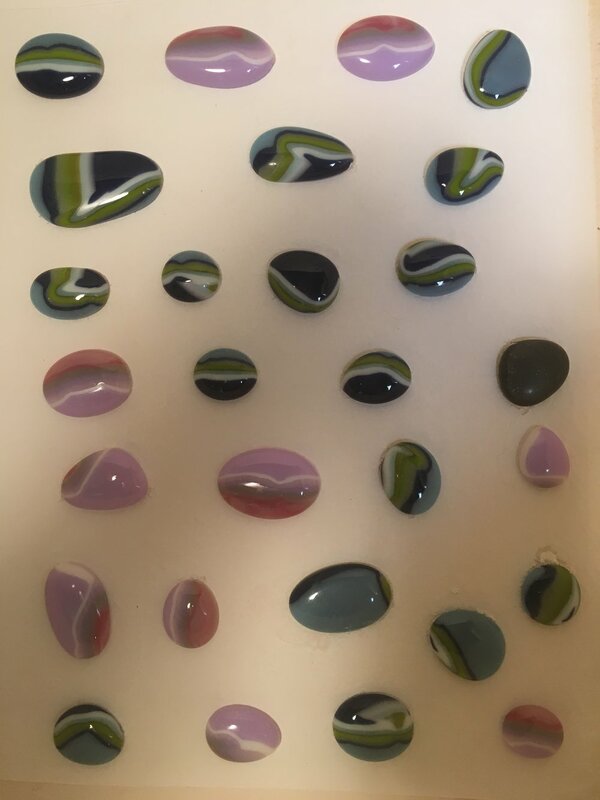 The above 2 pictures were taken before pulling these out of the kiln so I can see how the different pieces melted - it was about like you'd expect, if the piece was on an angle then the top color is the primary one in the final pendant. I might add decals to the ones that are more solid colored than the others. And of course the possibilities are endless here - these will be necklaces or I think I'll try turning a couple of the smaller ones into pairs of earrings. You could also use them in mosaics, stained glass, etc. And I plan to make some more even slices out of the rest of my puddles to use in a plate project.